Immigrant cyclists in NYC are disproportionately policed in the neighborhoods where they work and live, according to a recently-released analysis of NYPD cycling infraction data by the Biking Public Project. From 2007 to 2015, 92 percent of commercial cycling tickets were issued in just four Manhattan precincts, covering the Upper East Side, Upper West Side, and parts of Midtown — areas whose populations are 75 percent white. Meanwhile, non-commercial infractions were most heavily concentrated in precincts with high levels of poverty and majority-minority populations. The severely disproportionate policing of commercial cyclists by those four Manhattan precincts — the 17th (Midtown East), 18th (Midtown North), 19th (Upper East Side), and 20th (Upper East Side) holds true when controlling for the large number of restaurants in those areas. In Midtown East, for example, 291 commercial cycling summonses were issued annually for every 100 restaurants. In comparison, the 88th Precinct in Fort Greene and Clinton Hill issued just .37 tickets per year per 100 restaurants. Public conversations about cycling in the neighborhoods with heavy commercial bike enforcement tend to single out delivery cyclists. On the Upper East Side, for example, residents often complain about delivery cyclists in public forums about cycling and bike infrastructure. In response, Council Member Ben Kallos and the 19th Precinct have held “bike safety workshops” and promoted ticketing blitzes implicitly targeted at delivery workers. The Biking Public Project took interest in the NYPD data after Chinese delivery workers indicated in a focus group that interactions with police were one of their primary concerns. Workers often have to choose between breaking the law and their livelihood, which depends on fast service and good tips. Making matters more difficult, many delivery workers speak limited English, so they often don’t know what they’re being charged with until they get to court. Lee notes that the number of criminal court summonses for commercial and non-commercial cycling infractions has dropped in recent years. But the data is incomplete: NYPD has not made data for non-criminal traffic summonses available to the public. The traffic violation data that is available does not differentiate between motorists and cyclists. Lee warns that the media attention and public complaints about delivery cyclists, coupled with the reflective vests they are required by law to wear, continues to put them in an especially vulnerable position. Wow! Forcing minorities to wear special identifying clothing. That’s a bad idea with a strong track record of leading to those people being the victims of harassment and worse. I’ll say it again: Immigrant delivery bicyclists are scapegoats for our culture of traffic violence. It blows my mind how many “senior citizens” complain online and in person about dangerous delivery riders. Not once will they utter a word about the number of seniors killed or seriously injured by automobiles per year. As a resident of a neighborhood that is high on the list, I do have to say that the number of delivery cylists around my neighborhood that ride their bikes in a manner that befits the worst drivers we vilify here is quite high. First off, I think the system is rigged against them in that they, rightly, feel that they have to break the law to make a living. I think we need to fix that system. Restaurants should all charge for delivery and have enough delivery staff that they can make the on-time deliveries without having to cut corners. But as bad as I feel for them, if a sushi delivery rider on his electric bike is zipping up the narrow sidewalk where I am with my toddler, I will physically remove him from his bike before I let him zip passed my son at 12mph on a 3 foot wide sidewalk. I refuse to order delivery because I refuse to be part of the problem. When I want take-out, I call in an order and go pick it up myself. But I think it makes sense, the statistics being cited, because the police are going to focus on quality of life issues that are of issue to the residents. A lot of the outer borough restaurants deliver using cars, not bikes. The higher minority residential populations probably do not order as much delivery. I think the statistics are also flawed in that they are norming the data based on the number of restaurants, but what they should be norming with is, at the least, the number or restaurants that offer delivery. But for the conclusions to really hold more weight, it should be either infractions per delivery cyclist, or infractions per delivery. They should also look at, not the number of tickets per delivery cyclist per geographic area, but the precentage of tickets issues to delivery cyclists versus the percentage of cyclists within the geographic area that are commercial. For example, saying a cyclist getting a ticket in East New York is more likely to be a non-commercial cyclists and one getting a ticket in the UES is more likely to be a commercial cyclist could just be a simple correlation to the possible fact that any random cyclist is most likely to be commercial in the UES and non-commercial in East New York. The best statistic, which would probably be hard to come by, is the number of infractions per mile ridden for commercial cyclists in each area vs. the number of infractions per mile ridden for non-commercial cyclists. I’m not saying there isn’t a racial disparity, or even a racial undertone to the enforcement. What I am saying is that these statistics given don’t prove that to me and feel more like making the statistics match the conclusion rather than the conclusion match the statistics. You’re not actually serious? Are you? People who do THAT JOB are required to wear the vests. It has nothing to do with their ethnicity. Yes, I am serious and it has everything to do with their ethnicity. Read the article. 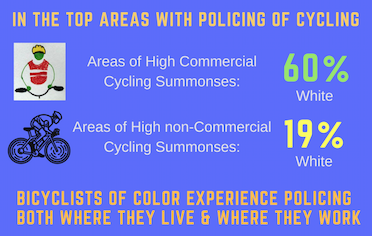 It is about minority cyclists being disproportionately policed. I note that once upon a time, when most working cyclists in NYC were Caucasian bike couriers, there was no requirement for them to wear distinctive clothing. Oh wait! Bike couriers still don’t have to wear distinctive clothing. Only food delivery working cyclists. Do you really believe that it is a pure coincidence that the only category of working cyclists who have to wear distinctive clothing just happens to be the people who are members of racial minorities? I think that, if vine couriers were still as prevalent as they were in the 90s, we would see them with a requirement as well. I think it is job specific, rather than race specific because the delivery cylists have the highest tendency to break the rules in a dangerous way. During the alternate side parking shuffle today, I saw a delivery guy from the local Thai restaurant driving his Vespa (not an eBike, a full on gas powered motorbike) down the sidewalk at what I estimate at 15mph. It has to do with the job, where you have to cut corners to make some semblance of a living. Outlaw tips, and require delivery people to get a living, hourly wage, and you will see a difference in behavior and perception. It would be interesting to see the same map with police patrol time spent on foot. I’m guessing there is a direct correlation. I have my doubts that even if the NYPD collects that information, that they make it available.